The friendship between Canadians and Mexicans is a special one, and nowhere is it more unique than on the plate. To celebrate this relationship, the Mexico Tourism Board is presenting a special edition of the Gather dining series, with a Vancouver event at Fayuca on November 21, and a Calgary dinner at Pigeonhole on November 23. Mexican chefs Jair Tellez and Hugo Duran will collaborate with their Canadian counterparts, Ernesto Gomez and Martin Vargas at Fayuca, and Justin Leboe at Pigeonhole, to create a five course dinner that brings together the flavours, indigenous ingredients, local produce and techniques of the two countries. As part of the cultural exchange experience, the Mexican chefs will get to visit markets, go foraging and meet local producers with their hosts to source the ingredients for each dinner. Also making the trip north will be Noel Tellez and Alonso Maldonado from Bichi, a Baja California winery producing natural wines using minimal intervention and traditional methods. A selection of the wines will be available as pairings at the dinners. Created by Arrival Agency, Gather is a series of communal dinners that bring together some of Canada’s top restaurant talent cooking alongside visiting culinary stars. Originally created as an element of YVR Food Fest in Vancouver, these unforgettable meals allow for culinary and cultural exchange of ingredients and techniques in a relaxed atmosphere. Attendees can come with a group or come alone and leave with new friends. The goal of the Gather dinner series is to include different communities, generate dialogue and push boundaries around food culture. Hugo studied visual art at the school of painting, sculpture and engraving "La Esmeralda”. After an extended stay in Germany he traveled back to Mexico and taught himself how to cook. 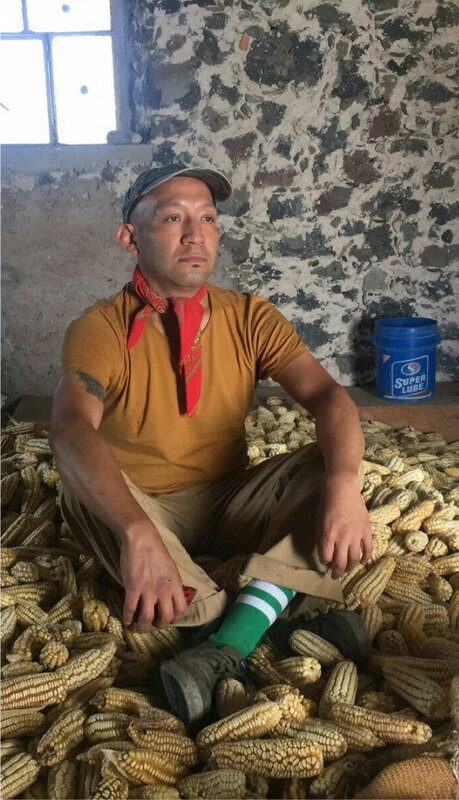 He worked in several restaurants in Mexico City and finally integrated himself as head chef of “Cocina Itinerante Pichon” (travelling pigeon cooking). Hugo Durand’s culinary work is based on the development of his personal culinary language and it is inspired on his travels, field research and study of bio-cultural diversity of Mexico’s centre region. He is what some would consider a nomadic chef. Tellez began his professional training at the French Culinary Institute, which led to an apprenticeship at Daniel, where he stayed and worked for one year. He returned to México from New York, and while garnering success at Laja he was presented with the opportunity to open a restaurant in México City. Drawn to the city and a new set of challenges, Tellez began working on opening MeroToro in 2008. In 2016 he opens his second restaurant in Mexico City, Amaya, which has a focus on natural wine and El Zorro Plateado in Playa del Carmen, with a focus on wood fire cooking. In 2017 he opens Fayuca in Vancouver which is Mexican inspired with a focus on a free flow of ideas and flavours along the Pacific Coast. Inspired by the setting of both the rugged naturalism of Laja, the slick metropolis of MeroToro and Amaya, or on the pleasure of the unknown in Fayuca, Tellez embraces the polarity of the situation and maintains his identity as the sum of its parts. Important development: Last Tuesday Laja was awarded the 42nd place on the San Pellegrino World’s 50 best restaurants from Latin America. So this man is Hot! bending natural wine bar with an emphasis on premeditated veggie-focused cuisine. Calgary as a culinary destination. The Calgary edition of Gather is taking place at Pigeonhole, which recently cracked the top ten in the Canada's 100 Best Reatsrant rankings. Sign up for news and updates.